Fred. Daphne. Velma. Shaggy. Scooby-Doo. Roaming the globe in their lime-green Mystery Machine, they’ve solved countless crimes and debunked dozens of sketchy supernatural shenanigans. But what if the horror was real? Something terrible has transformed our world, turning millions of people into mindless zombie hordes. And only five people—well, four people and one mangy mutt—have the smarts, the skills and the sheer crazy courage to stare down doomsday. Can these pesky kids and their canine companion—using every incredible contraption in their arsenal—defeat the evil that has overwhelmed planet Earth? We’ve got only one thing to say about that: ZOINKS! From comics mastermind Jim Lee and the superstar creative team of Keith Giffen (JUSTICE LEAGUE 3001), J.M. DeMatteis (JUSTICE LEAGUE DARK) and Howard Porter (JLA) comes SCOOBY APOCALYPSE, a whole new spin on the most beloved paranormal investigators in history. Get ready to give Scooby Snacks a whole new meaning! 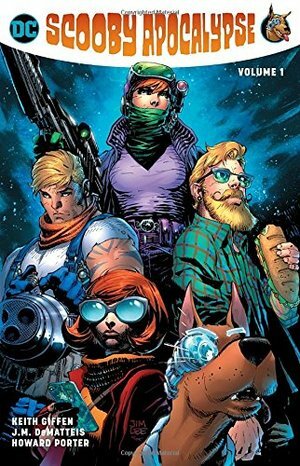 SCOOBY APOCALYPSE VOLUME 1 collects issues #1-6. This is...ok? I think some people will like this story a lot more than I do. The art is pretty good though. I wish I was a little more subtle or actually had a lead in to the apocalypse part. This has so much unnecessary dialogue in it that it is repeating itself. Like, What if they just solved mysteries and they're learning the monsters are real and need to discover how...then find out about the lab and the whole transformation nanobot things. That would defiantly be a lot more mystery! Instead they just kinda put you in the middle of it, Go! Right off the bat with crazy monsters! Daphne's character is ehh?...I don't understand why she has a mystery show and they don't give her much character besides angry. Fred wouldn't be missed if he wasn't in this vol. at all. Shaggy seem pretty true character. Scooby I actually like the smart dog origin story. He still has his character but I like the more vicious bits. Velma is still brainy..and why is she the only one who gets an origin story?